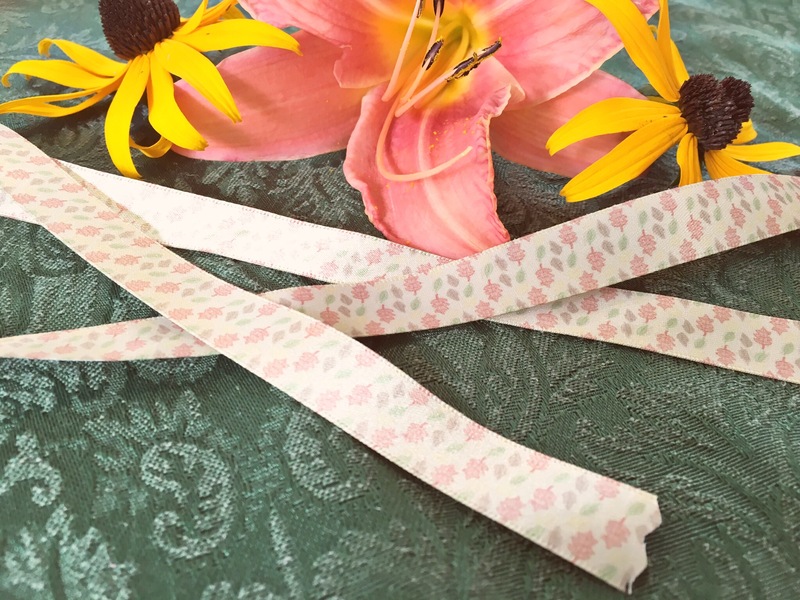 How to Make Your Own Autumn Leaf Printed Satin Gift Ribbon - Genue DIYGenue Inc.
With summer drawing to a close, it’s the perfect time to start preparing for the autumn season! This month at Genue, we’re making some leaf print satin ribbon inspired by the organic patterns found in nature. 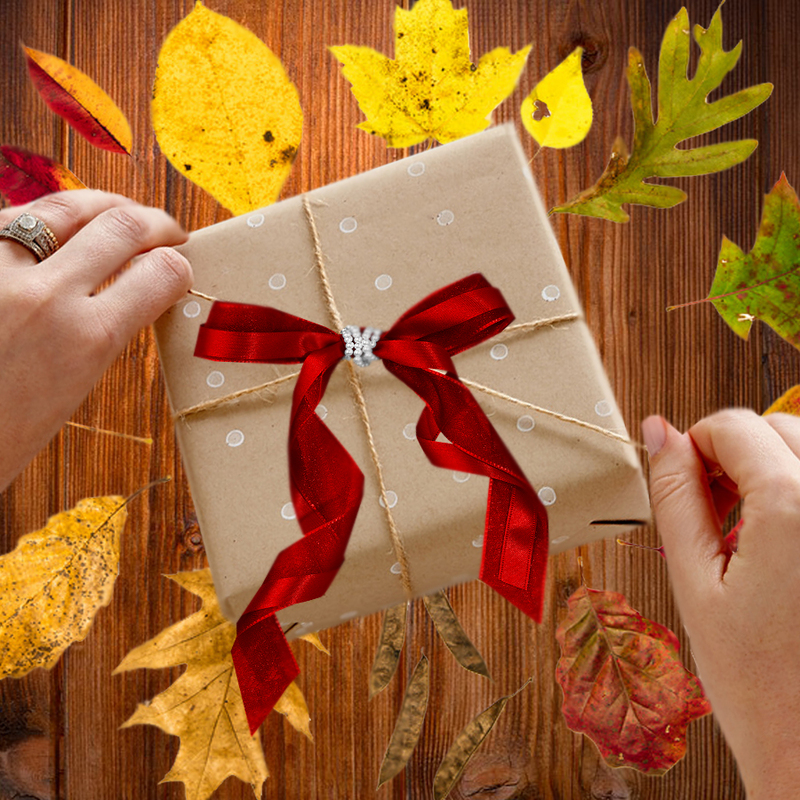 Perfect for adding a DIY touch on presents for those in your life who have fall birthdays! Read on to learn how to make your own! Begin your pattern by picking out a color scheme. This month our project involves a rainbow of autumnal hues—a pale yellow for the background, and a smattering of deep reds, mossy greens, golds, and browns. To begin your design, let’s start by filling your background with color. Press the ‘Color’ button to open up the color selection window. 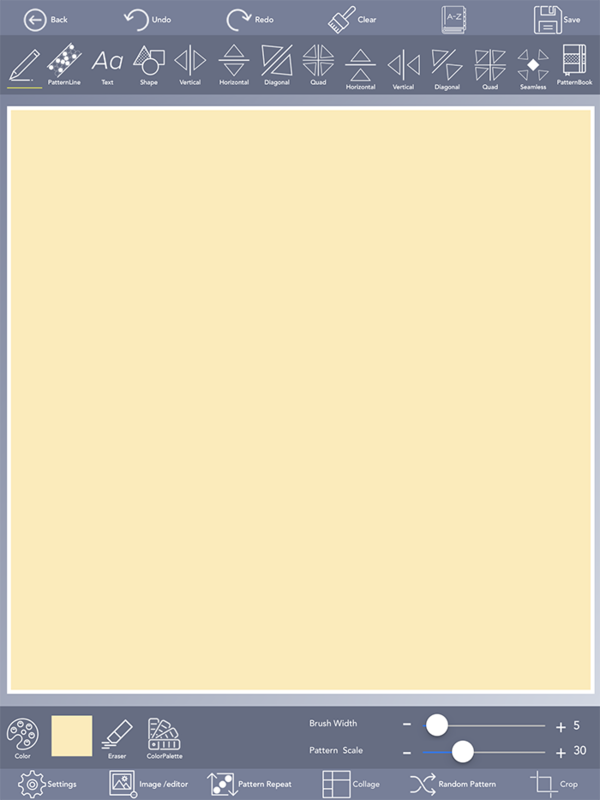 Pick a pale yellow or cream color, and then make sure that the ‘background’ button at the top of the window is highlighted. When you’re done, hit the blue checkmark at the top right of the window to finalize your selection. Your canvas should now be filled with your chosen color. Now it’s time to begin drawing. 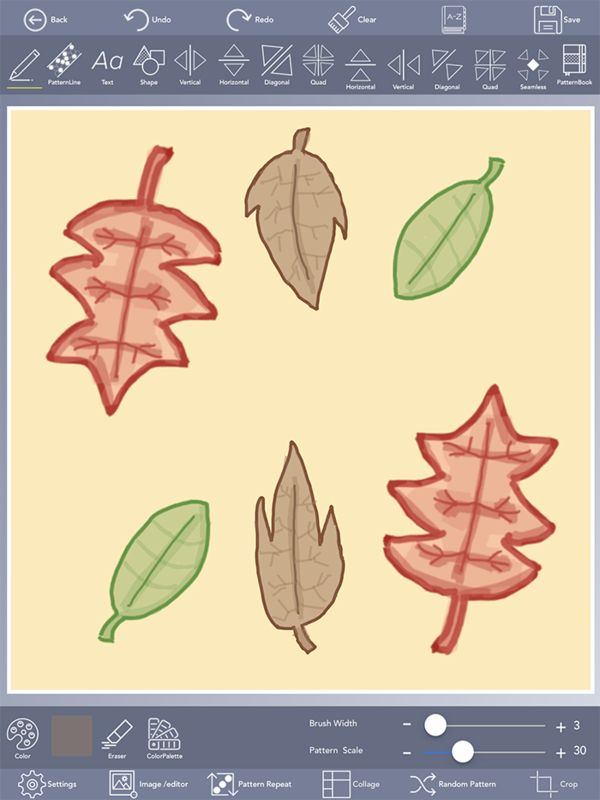 Let’s begin by drawing some red leaves—return to the ‘Color’ window and pick a dark red color of your choice. Adjust the size of your brush to about 5-8 pixels wide using the slider bar at the bottom left of the screen. Press the ‘Diagonal Mirror’ button to mirror your marks diagonally across the canvas—that way, when you draw one leaf, another one will appear on the other side of the canvas! 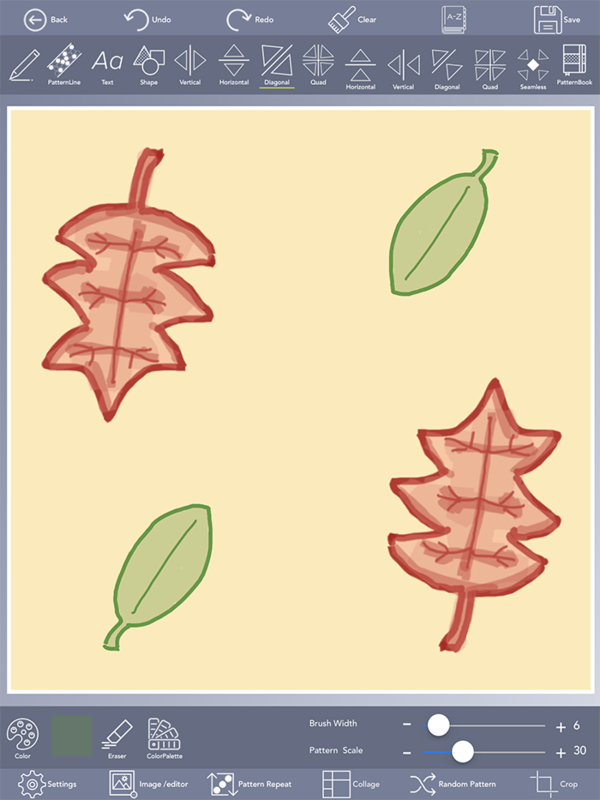 We began our design with some pointy maple-inspired leaves. Now let’s draw some details on our leaves to make them more life-like. 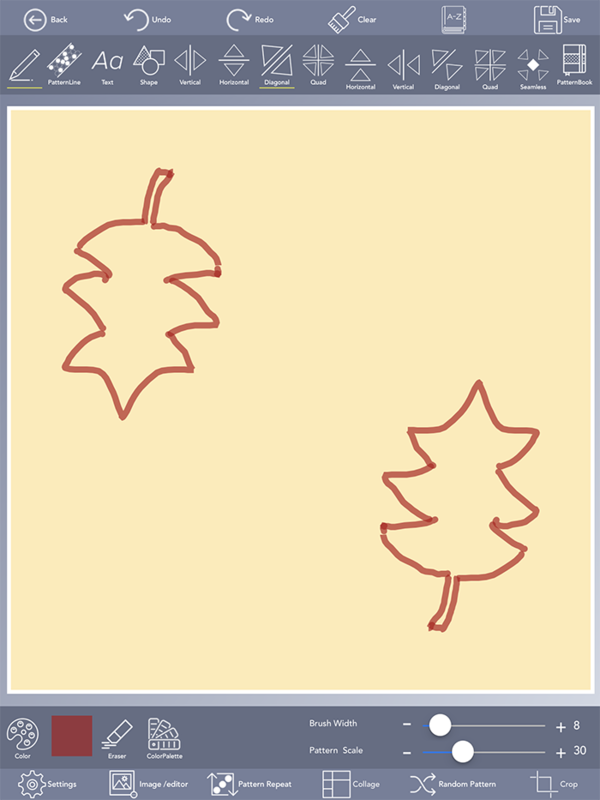 Adjust your brush width using the slider bar to about 2-3 pixels wide, and draw some ‘veins’ in the middle of your leaf. How realistic you’d like to be with your amount of detail is up to you! When you’re satisfied with the look of your leaves, it’s time to add some shading. Using the same shade of red as before, open up the ‘Color’ window and change the opacity of your brush using the slider bar to about 45%-50%. Trace over the veins of your leaves. Then, go back into the ‘Color’ window and change the opacity to about 25%-30%. Color in the rest of the leaf with this color. Now let’s draw some long, oval-shaped green leaves! 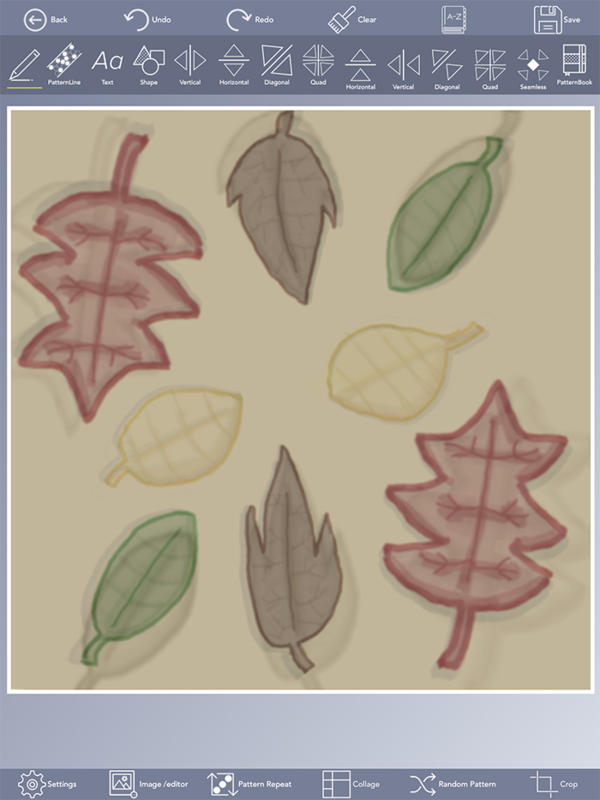 Pick a dark green color and, continuing using the ‘Diagonal Mirror’ tool , draw two more leaves. Next, like we did with the red maple leaves, adjust your brush width to a size smaller than the outline of the leaf, and add some veins for realism. When you’re ready, go to the ‘Color’ window and lower the opacity of your brush to about 30%-40% percent, and color in your leaves. 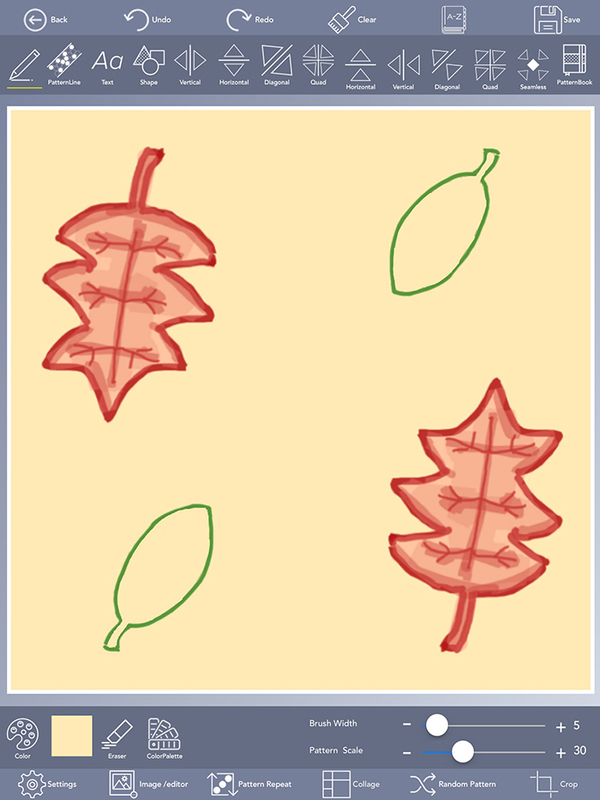 For a different sort of look, you can even experiment with different opacities to draw more veins on your leaves! When you’re ready to move on, go back to the ‘Color’ window and choose a shade of brown that you like. 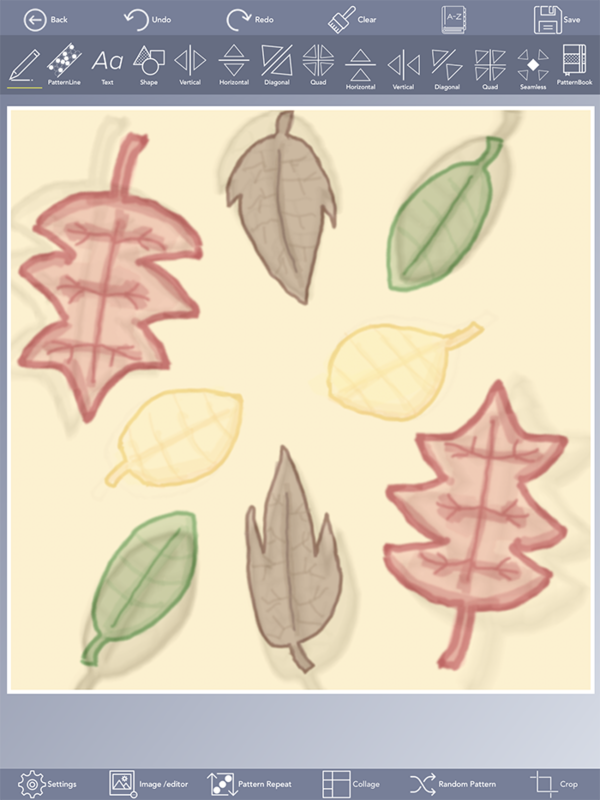 Continue using the ‘Diagonal Mirror’ tool and draw two more leaves near the middle of the canvas. Follow the same steps that we’ve been using for coloring the last few leaves—adjust your brush width to add veins, and color in the leaves using a low opacity of the outline color. We’re almost done now! 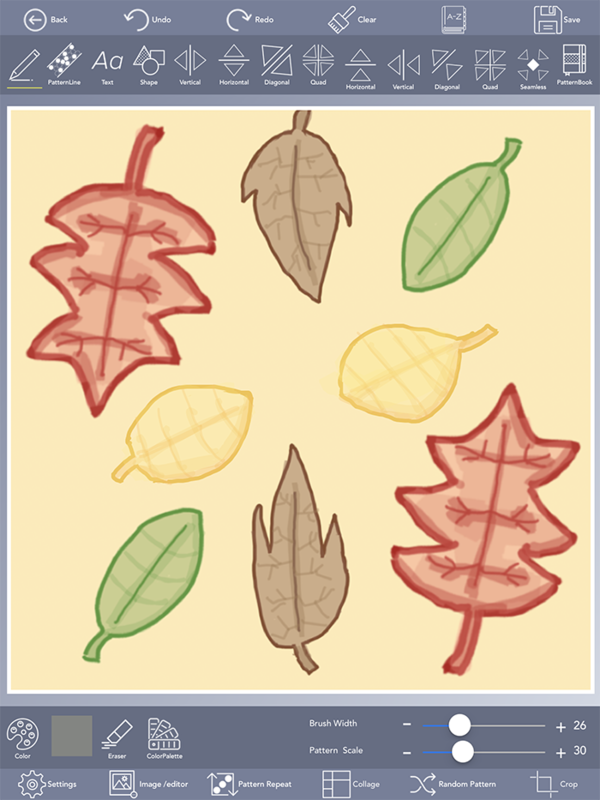 Let’s finish off our pattern by drawing two final golden leaves. Pick out a gold color of your choice with the ‘Color’ window and draw two more leaves. Follow the same steps from before for adding detail and shading. When you’re satisfied with your design so far, let’s add some filter effects! To do this, start by saving your pattern to your device’s gallery. Then, click the ‘Image editor’ button and open up the image you just saved to your device. Before you hit the checkmark at the bottom left of the screen, you’ll notice that there are some new buttons available! Press the ‘FX’ button to show the available photo effect options. Let’s begin with the ‘filter’ option. You’ll notice that you can change the transparency of the effect with the slider bar at the bottom left—adjust the slider so that it’s at 0.2-0.3% transparency, and then press the blue checkmark at the top right of the screen. You’ll be able to pinch and grab this new filtered ‘layer’…We moved ours slightly off-center, so that it looks like falling shadows of the leaves. Now let’s add another effect! Follow the same steps as before—save your image to your device’s gallery, and then press the ‘Image editor’ button and select the image you just saved. Press ‘FX’ and then choose the ‘Mono’ option, again setting the transparency to about 0.2-0.3%. Hit the checkmark at the top of the screen when done, and adjust this new layer to where you’d like it. If you’re confused, don’t worry! You can watch this short video of the entire filter-adding process below! When you’ve finished creating your pattern, it’s time to repeat it! Hit the ‘Pattern Repeat’ button at the bottom of the screen to begin. Use the slider at the top of the screen to adjust the number of times your image will be repeated—for this project, we repeated our pattern 6-7 times. Experiment with the rotation of the quadrants by dragging the ‘R’s at the bottom of the screen, and see what look fits your design best. When you’re done, hit the ‘Save’ button and save your pattern to ‘Final Designs’. Select the ‘Final Design’ option on the far right. Leave this screen and navigate to left side bar where you’ll find your saved Final Design. Select your Design and choose Export which will take you to screen below. Make your image dimensions 5 inches by 5 inches by typing in the numbers under ‘Image Size’ at the bottom of the screen, and adjust the DPI to 150 pixels by using the slider bar. Email either a PNG, JPEG, or TIFF file to the device that you’ll be ordering the towel from so that you can access the image later. Our chosen Maker this month is Bags of Love! We’ve ordered their custom printed satin ribbon for this project. To order your own, log onto their site and click the green ‘start design’ button. This will take you to their editor screen, where a template of the ribbon where will be shown. Select your preferred ribbon length, width, and number of repeats with the drop-down menus on the right. For our ribbon, we ordered 19 ½ feet of 1/2 inch wide ribbon, with 1 repeat—you’ll see why very soon! When you’ve entered this information, click on the blue ‘Design’ to upload your image. 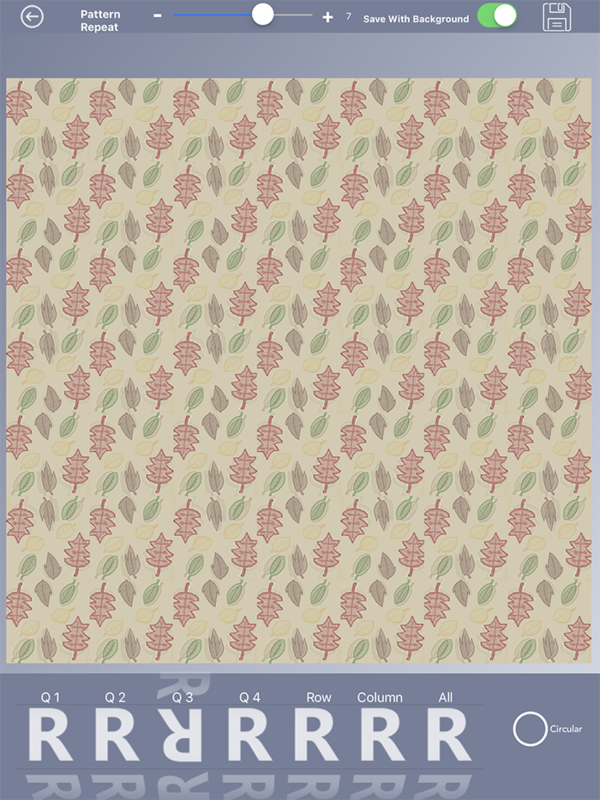 You’ll be taken to a new section of the page, where you can click the ‘Add Image’ button to upload your pattern. 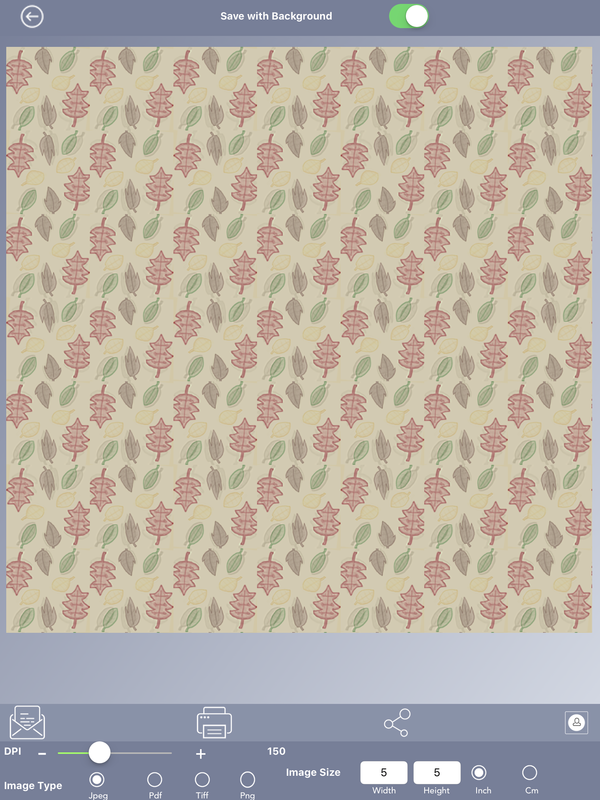 Use the tools provided to put your pattern onto the ribbon template. Because we wanted to fit many leaves onto the ribbon, we actually uploaded two copies of the same image, scaled them down to a size we thought was appropriate, and overlapped the two images in the middle of the ribbon. Once you’re satisfied with how your design looks, click the ‘Preview and Buy’ button, check the preview screen to double-check your product, and then follow the prompts to enter your billing and shipping information. Once your ribbon arrives, you’ll have a unique piece of artwork to add to your gift-wrapping repertoire! 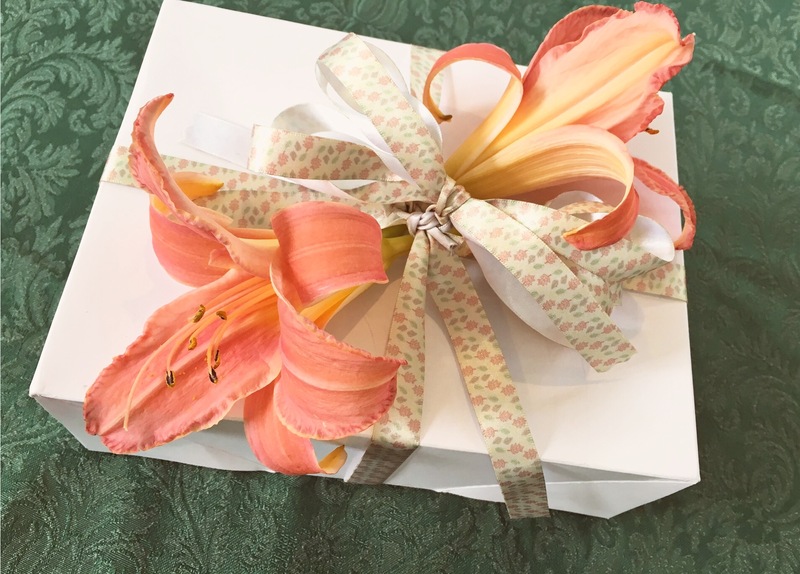 Enjoy your one-of-a-kind satin ribbon with your Genue design!